Takarazuka Wiki | Yorozuyo Chiyoko (萬代千世子) / Yorozuyo Chiyuki (萬代千幸)　1949-1954 Otome or magazines? Forums > Ask Questions > Yorozuyo Chiyoko (萬代千世子) / Yorozuyo Chiyuki (萬代千幸)　1949-1954 Otome or magazines? 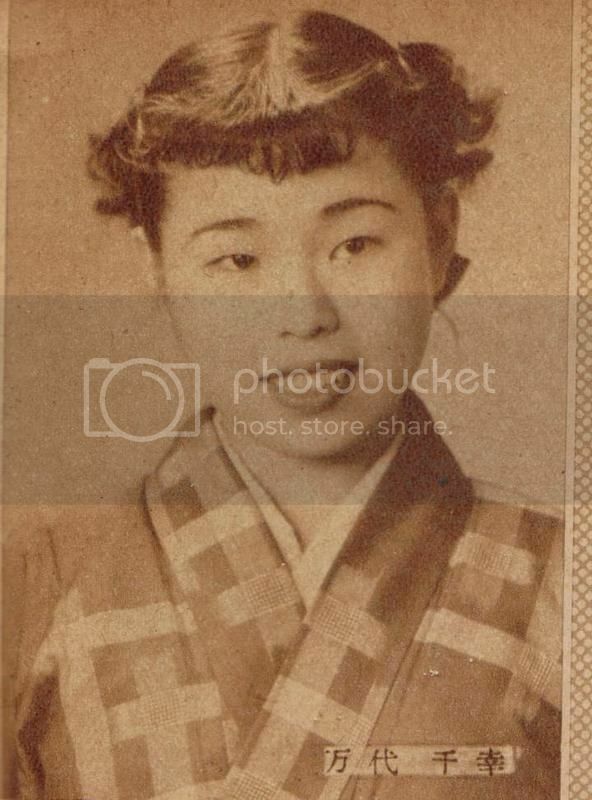 Yorozuyo Chiyoko (萬代千世子) / Yorozuyo Chiyuki (萬代千幸)　1949-1954 Otome or magazines? Hey all! I'm looking to solve a mystery. In my 80th and 90th Anniversary books, as well as on the Japanese Wikipedia, there is an actress listed as Yorozuyo Chiyoko (萬代千世子). She is listed as having joined in 1949 (36th class) and retired in 1954. In my 1951 Otome there is an actress named Yorozuyo Chiyuki (萬代千幸)　who joined in 1949, and no "Chiyoko." She is not listed as having changed her stage name, but I'm guessing that that is exactly what happened. That, or this Otome had an error in it both under her photo and in her profile data. So my question is: Which name did she begin with, and which did she change it into later? Anyone with relevant Otome, Graph, Kageki, or the 100th anniversary actress book, could you let me know what you find? Thank you! I'm not up to figuring out such things in printed books in Japanese (sorry) but going by the entry for Itsuki Chihiro, the name in parenthesis is the initial name and the main listing is the current/final name. So she must have only been Yorozuyo Chiyoko for less than a year, then, if the 1951 Otome has her listed as Chiyuki. She is listed with the name 萬代 千世子 under her photo on the following page. That's awesome! So she did start with that name originally. Hm, I wonder if the 千世子 was a latter change, or a misprint that has been continued. Again I wish the 100th anniversary books hadn't sold out so quickly.... I'd be curious to see what that one says compared to the 80th and 90th. She's listed as 萬代千幸 in the 1949 Otome under her photo, however she is listed as 万代千幸 in the back information section. She was in Yukigumi then. I compared the 1949 Otome info with the info for mitsuesan's 万代千幸 and it's the same. 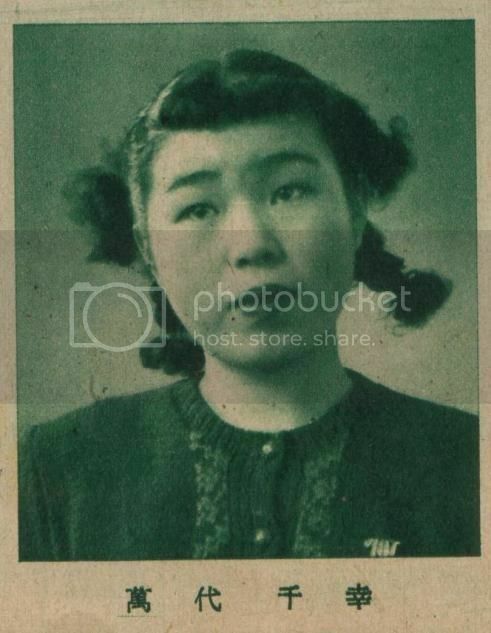 However she was apparently in Hanagumi by 1951. Weirdly enough I don't see a 萬代千幸 listed in my 1951 Otome. 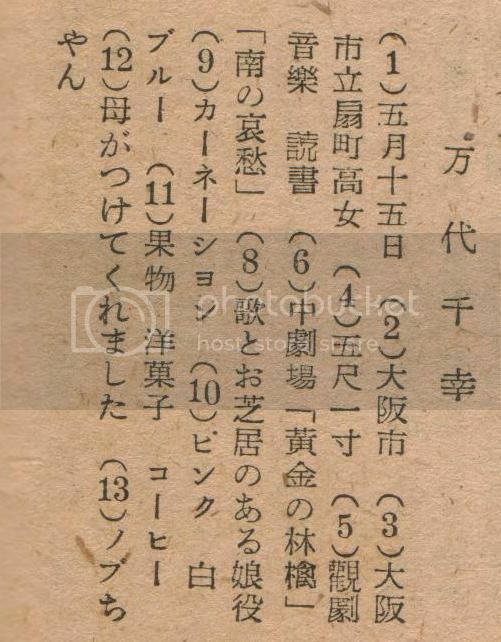 She is also listed as 万代千幸 in Yukigumi's September 1950 program for 雨月物語 / キュウバ / 人魚姫. Oh, man, really? Really? *sigh* I guess it makes sense, though. A lot of the older kyuujitai characters were being switched over to the simplified forms around that time. 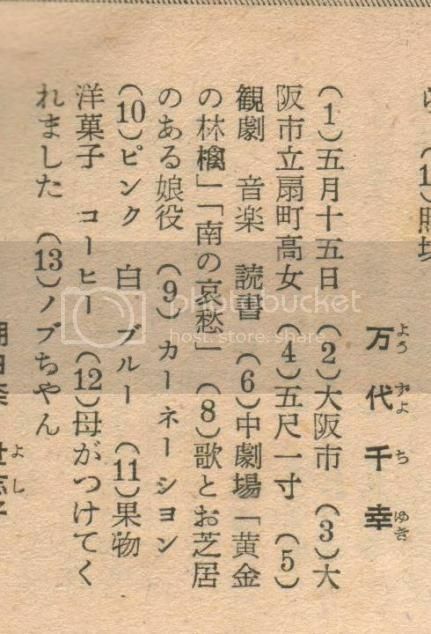 There is a sienne named Yorozuyo Chiyuki (but written as 万代千幸) in current members list as printed in August issue of KagekiGraph, 1951. Maybe she had changed her name spelling as well.